Owls are among the birds with the greatest power to fascinate non-birders, for good and ill. From the ancient Greeks to my ex-boyfriend, people are prone to invest them with both love and meaning. Why? I don’t know. They’re predators, yeah, but so are the most commonplace of hawks. They’re hard to see, but so are rails, and hardly anyone gives a crap about rails. They’re freighted with lore, but that borders on begging the question, because how did they get that way in the first place? Anyway, people are gaga about them. 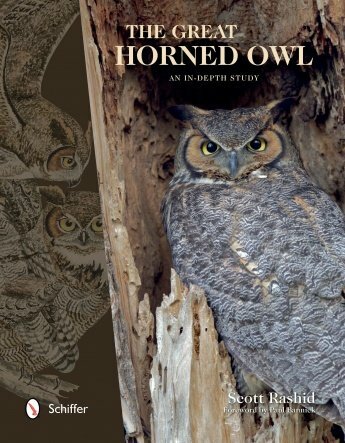 One such person is Scott Rashid, who early in his tome The Great Horned Owl: An In-Depth Study recounts his own first owl sighting at the age of sixteen. Young Scott put in yeoman’s work first identifying, then attempting to photograph the birds he stumbled across while hunting rabbits with a friend, and apparently his drive has stayed with him from that day to this. He now runs the Colorado Avian Research and Rehabilitation Institute out of Estes Park. As such, it is unsurprising that this book is well-salted with first-hand anecdotes of owl close encounters, and indeed the eighth chapter is entirely dedicated to the author’s work with owls that have one way or another wound up in peril. 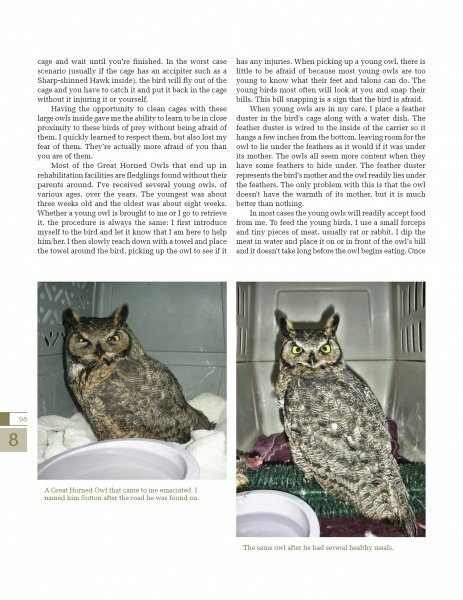 In addition to his passion for bird rescue, Rashid is also a talented artist, and his paintings and sketches supplement the many photographs in illustrating various aspects of the Great Horned Owl‘s appearance and behavior. As with many of the books I’ve seen from Schiffer Publishing, the lavish illustrations here are one of the book’s great strengths. The book’s weaknesses are mainly in the organization of the text. From the macro to the micro level, I found that the information provided, while copious and often informative, could have been laid out better. For example, I am not sure why the chapter entitled “Monitoring Nesting/Growth of Young” should occur, not directly after the chapter on “Nest Description”, but separated from that chapter by an extremely long one on “Hunting/Food Preferences”. Issues of this sort pervade the book, with scientific data and anecdote thrown together all willy-nilly and important topics like pair bonding and mortality wedged into mere subheadings. The end matter includes a glossary and references cited section, but sadly lacks an index, making attempts to find specific information within the book even harder. Despite these weaknesses, this book will no doubt find its audience in the legion of owl lovers that fill our world. 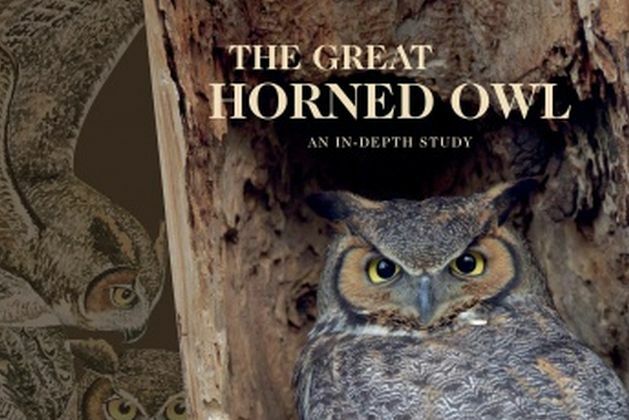 The Great Horned Owl: An In-Depth Study is available now from Schiffer Publishing. Where Are You Birding This Third Weekend of July 2017?